Have you ever considered putting vegetable seeds in a tin can or air-tight pouch ‘just in case’ you need to grow your own food? There is a hot new trend sweeping the world for saving seeds that are non-GMO, heirloom and organic. It’s a good idea to prepare for the future in these uncertain times. Think of starting your own seed vault for the future to pass onto your children or grandchildren. Seeds do not last forever. Typical seed packet labels for garden seeds state an ‘expiration date’ of around a year but there are methods for extended the sprouting percentages for seeds and by freezing the seeds and you can extend the chances for 90% sprouting for up to 30 years; long-term cold-storage units may become the rage if the demand presents itself. 600 miles from the North Poll, hidden deep inside a snow covered mountain is buried the world’s most protected seed supply storage in the Svalbard Global Seed Vault. Nicknames such as the “Doomsday Vault”, the “Noah’s Ark for seeds” and “the Fort Knox of food” have added to the fame of the Vault. Despite war or climate change, these seeds will remain frozen and intact to protect the world’s food supply despite natural or man-made disasters. The Vault can therefore be considered the ultimate insurance policy for the world’s food supply. It will secure for centuries, or longer, millions of seeds representing every important crop variety available in the world today. What’s The Doomsday Seed Vault Really For? 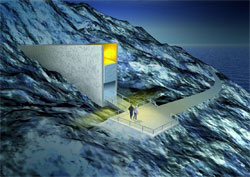 The Seed Vault was officially opened on February 26, 2008, by Norwegian Prime Minister Jens Stoltenberg. At that time, Prime Minister Stoltenberg deposited the first box of seeds into the vault, rice seeds from 123 countries. The initial deposit contained 268,000 different seed samples. 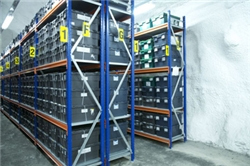 Two years later, March 2010, the vault contained 500,000 samples making it the most diverse inventory in the world. Each of the samples contains about 500 seeds, meaning there are now over 250 million seeds in cold storage in the Vault today. While the Svalbard Global Seed Vault is a valuable contribution to the world’s food supply, we pose the question to you, our own readers, to ask you if you own any seeds that might be a safeguard against rising food costs for you and your family? How about a packet of tomato seeds? No? Well, this might give you some ideas to plan ahead so you can put a packet of them in your freezer, JUST IN CASE, you ever need them. Of course, we recommend you own your Portable Farms® Aquaponics Systems so you can have a consistent supply of fresh, nutritious food on hand regardless of weather or economic forecasts.